On Saturday President Abdel-Fattah Al-Sisi will be sworn in for his second term in office. The ceremony will take place in front of parliament. Al-Sisi is expected to make a speech after the ceremony to review the accomplishments of his first term and indicate his priorities for the next four years — his second, and according to the constitution, last term in office. In his statement the president is likely to focus mostly on domestic issues, especially the ongoing anti-terrorist Comprehensive Operation Sinai 2018 and, with a new wave of fuel subsidy cuts just around the corner, on economic reforms. He is also expected to address foreign policy guidelines for his second term in office. “I guess for the most part we will be seeing more, rather than less, of the same. The basics of Egyptian foreign policy have remained more or less unchanged since [Hosni] Mubarak took office in 1981: we remain close allies with the US and leading Arab capitals; we keep a close eye on regional developments with a firm stance against the eruption of any armed conflicts and we work for national and regional stability,” said an Egyptian diplomat. According to this diplomat, Al-Sisi’s priorities for the first year of his second term will include managing the fallout from Ethiopia’s construction of the Renaissance Dam; consolidating relations with the US beyond the disagreements of the past two years; promoting and securing a final settlement of the Palestinian cause and keeping Islamists as far away as possible from power in Libya and Syria, two countries of crucial national security interest to Egypt. Egypt is planning to send a new ambassador to Washington later this year after Yasser Reda, the current head of Egypt’s diplomatic mission in the US capital, finishes his term. Foreign Ministry sources say Ihab Badawi, Egypt’s current ambassador to France and the first presidential spokesman following the 2013 ouster of Mohamed Morsi, is favourite to get the post in Washington. Both Egyptian and American accounts of bilateral relations agree that the high expectations Cairo had of its relations with Washington post the Barack Obama presidency have not been fulfilled. There has even been mention of unexpected hiccups. In a recent phone call between President Al-Sisi and US Vice President Mike Pence informed sources say the president of Egypt was very keen to affirm to the American official Cairo’s commitment to work to resolve any differences and to consolidate relations. Cairo-based Western diplomats say President Al-Sisi is very keen to pursue a policy of zero confrontation with the US. One Western diplomat suggested Al-Sisi would be loath to see last year’s cut in US military aid to Egypt repeated “because this is not a very good sign for the strength of relations with the current US administration which are a clear asset for Al-Sisi”. He added that Al-Sisi would rather flag a more dynamic relationship, with a possible exchange of visits between the two heads of state, “and something might be in the works, but we will see”. More significant, according to this and other Western diplomats in Cairo, is Al-Sisi’s keenness to advocate the proposals Donald Trump is planning to offer, possibly in the next few weeks, as a final peace deal between the Palestinians and Israel. Egypt, they say, is throwing its full diplomatic weight to secure positive Palestinian engagement. “It is a priority. And this is especially the case given the declining health of Palestinian President Mahmoud Abbas,” said an Egyptian diplomat. He added that the issue was high on the agenda of the talks Al-Sisi held last week with visiting Jordanian monarch King Abdullah. If Egypt could get the Palestinian-Israeli track moving in the direction of the Trump plan in the next few months it would be a big plus, say Egyptian diplomatic sources. Not only would it revive the long stalled Egyptian-US partnership for a political settlement of the Palestinian struggle, it would allow for Egypt and its closest Arab allies the UAE and Saudi Arabia to push forward a regional economic agenda that will be in Egypt’s economic interest and in the political interest of both the UAE and Riyadh. It is an agenda Washington supports, not least because it would involve an unprecedented, and public, level of normalisation with Israel. With this end in mind Israeli Prime Minister Benjamin Netanyahu is expected to visit Egypt, possibly this summer, says a regional diplomatic source. “I guess this is one of the things that might come up with his second term in office. Relations [between Egypt and Israel] have gone very well during Al-Sisi’s first term given the joint interest of both countries in the war on terrorism and their shared sense of pragmatism,” said the source. 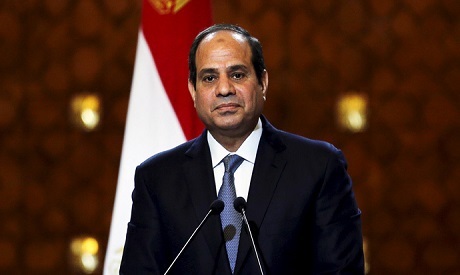 Cairo has so far preferred a low profile in its management of relations with Tel Aviv but this is likely to change, if not at the very beginning of Al-Sisi’s second term then sometime down the road, Egyptian diplomatic sources agree. But there is no doubt in diplomatic quarters that the top foreign policy priority for the first weeks of Al-Sisi’s second term will remain the management of sensitive and so far stagnant negotiations with Ethiopia over the Grand Ethiopian Renaissance Dam (GERD). Egypt, the downstream country set to suffer most from the filling of the mega dam’s reservoir, is seeking an agreement under which the inevitable loss from its annual share of Nile water is kept to a minimum. Ethiopia is making promises but has so far been unwilling to commit to guarantees. “The [Ethiopian delegation] sit in joint meetings with a relatively positive attitude but then refuse to sign anything they say they agree with,” said an informed Egyptian diplomat. To make things worse, he added, Sudan acts in a similar fashion. On Tuesday, Foreign Minister Sameh Shoukri was expected to receive his newly appointed Sudanese counterpart Al-Dardiri Mohamed Ahmed for talks in Cairo. Later in June the foreign and national security ministerial delegations of the three countries are expected to meet. A three-way meeting between heads of state is also being discussed. Egypt is hoping that before the end of the summer, when Ethiopia is set to start filling the GERD reservoir, an agreement on managing the situation will have been reached. Informed government sources concur that securing an agreement that does not compromise Egypt’s water security is the top priority, and the toughest challenge, for Al-Sisi’s foreign policy in his second term. They also agree that while Cairo is already working on alternatives, including water desalination and retreatment plans, it needs to secure a satisfactory end to negotiations with Ethiopia not only because they involve the hypersensitive issue of water but impact on Egypt’s status in east Africa as a power to be reckoned with.